Vantage Point director Pete Travis carries the burden of attempting to adapt the nonfiction novel The Fall of Apartheid, written by politician and author Robert Harvey, into a piece of work that's somehow both accurate and stimulating. The result is Endgame, a no-frills pot boiler of a historical thriller shot almost in a documentary fashion with shaky-camera movement and dusty visuals to pump up the realism. It attempts to journalize the events leading to Nelson Mandela's release in the late '80s during the collapse of apartheid in South Africa, a topic that receives quite a bit of attention in 2009, and comes out of the bunch with admiration for its grounded tact and sizzling performances. More specifically, Endgame concentrates on the cloak and dagger discussions between the National Party and the African National Congress (ANC), first solicited by business-motivated Michael Young (Jonny Lee Miller of "Eli Stone) as a representative of mining firm Consolidated Gold to cool the unrest in the area. He brings together Thabo Mbeki (Chiwetel Ejiofor), the rebellious spearhead for ANC, and Professor Willie Esterhuyse (William Hurt) to come to a conclusion about the weakening presidency of President P.W. Botha and the unrest brooding in the region. Their talks are initiated with middling motives from interested parties, but their resolve to quash apartheid in the area -- and ultimately free political prisoners, including Nelson Mandela -- rises up into an psychologically straining union with a set target in their sights. With terrorist efforts surrounding the political strife, they've got to play it safe. Endgame crams a lot of history into its brisk, panicky 100+ minute sprint, all swelling around a central plot device that involves a group of men having roundtable discussions. It'd be a triumph to make that out to be a tense affair for our eyes, and director Pete Travis is up to task. He gives gravity to their talks in the English countryhouse, replicating the events that occurred with a precision that emphasizes every line of dialogue, every movement towards freedom. The demeanor is naturally stiff, mind you, so the air is thick even when situations don't call for it. But when a hidden strategic conversation between two men on a grassy hill takes place outside of already hidden talks and it still retains a level of nail-biting intensity, you know you've got all of your ducks firmly in a row. Naturally, both Chiwetel Ejiofor and William Hurt are potent casting decisions for Thabo Mbeki and Willie Esterhuyse respectively. 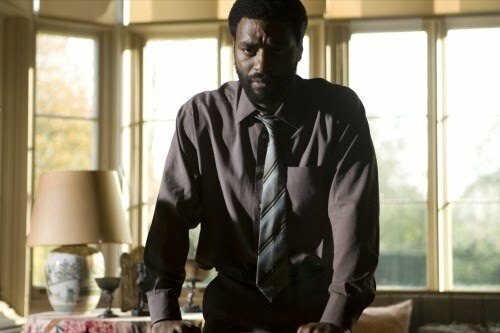 Golden Globe nominee Ejiofor resembles Mbeki to great lengths, not so much for his physical attributes but for the way he's nailed down his speech and disposition. He continues to impress with his capacity to grasp the screen, especially in sociologically relevant productions similar to Dirty Pretty Things and Children of Men. The same can be said for William Hurt's accurate projection of Esterhuyse, delivered with a calm temerity that's inspiring. The energy created between the two becomes an entity of its own, however, assembling into a great meeting of the minds that's dazzling to witness on even a purely dramatic level. But probably the biggest surprise comes in Jonny Lee Miller's turn as Michael Young. He balances the weasel-like nature of the character well with a sense of greater purpose. And, though he's only seen through a modicum of sequences, Clark Peters offers one of the better projections of Nelson Mandela I've seen. However, the film's successful tone and powerful performances can't dismiss the fact that there's a lot of material swirling outside the secret negotiation's stratosphere, something that Endgame cannot completely convey in its time with the audience. Like the title suggests, it follows the conclusion to a conflict, and we've got to try and pick it up whilst diving into the picture's tension. It illustrates Mandela, through scattered quick shots into his jail cell, as a falsely imprisoned man -- a figurehead for our story -- who commands respect. Yet the concentration here powers forward to a resolution for a clash that's not underlined with enough clarity here, at least for those unaware of its nature, to grasp. The ANC and the National Party are butting heads over political and social injustice, and these talks will pave a path for peace and righted injustice. That's what the viewer can discern from the dervish of political dust-kicking, which is what truly matters, but the full content is too thick in its outskirts to ensnare completely on its own. So, essentially, we can look at Endgame as both an accomplishment of political suspense and as a climactic appendage to other films about the subject, such as Cry Freedom and Goodbye Barafa -- not to mention as a forward to Clint Eastwood's Invictus. If anything, it left me gripped because of its projection of the passionate efforts in two men striving for sovereignty, along with their willingness to delve into dangerous grounds for a greater purpose. As Pete Travis' film comes to a close, with the dust settling and history revealed through archival footage with a group of great minds huddled around a television, it caps off the sweat-inducing temperament with an expected ray of hope. That, in itself, makes the bustling nerves of the picture worth the time.